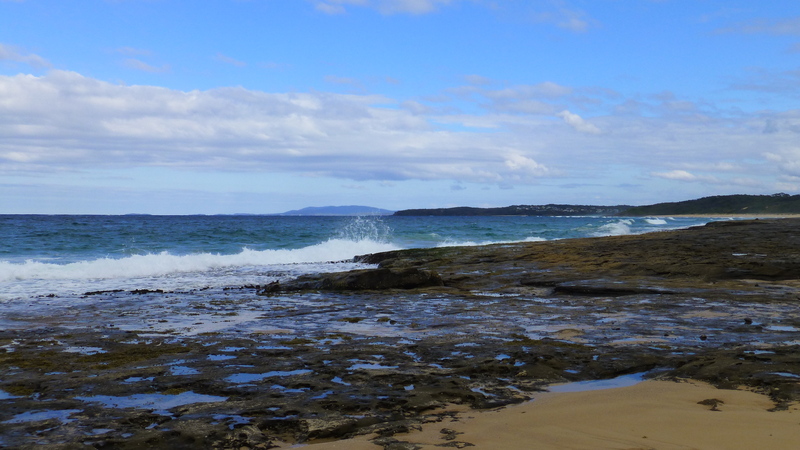 If you take a walk along Racecourse Beach at Ulladulla at any time of the year, chances are that you will meet only a handful of other people. And the odds are even better that those people will walk right on by and not even notice a tiny bird that makes its home on the beach and in these sand dunes. It’s hard to see – it’s tiny and it’s so well camouflaged. It’s not until this petite bird moves with its scurrying ways that you realise that it’s there at all. It runs quickly along the sand before pausing suddenly. As you approach, it flies off for a just short distance and then begins to hunt for food again. 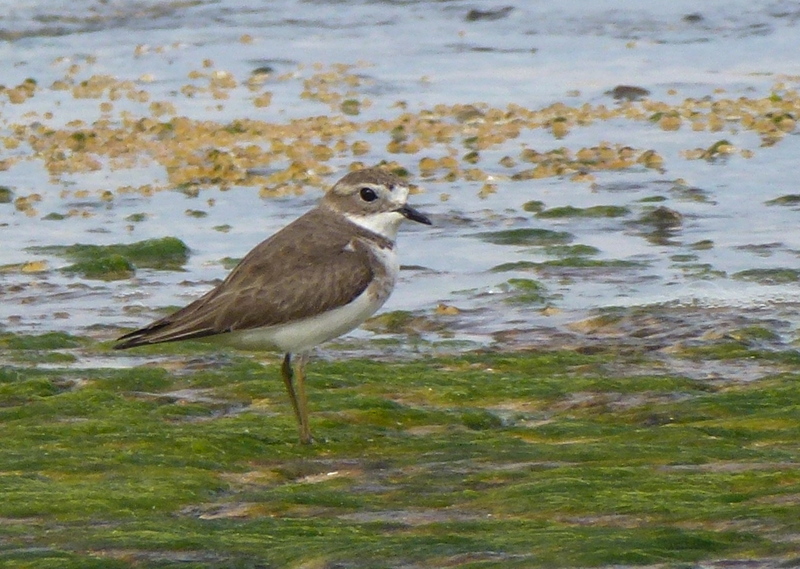 Three species of little plovers live in this area – but which of the three is this one? 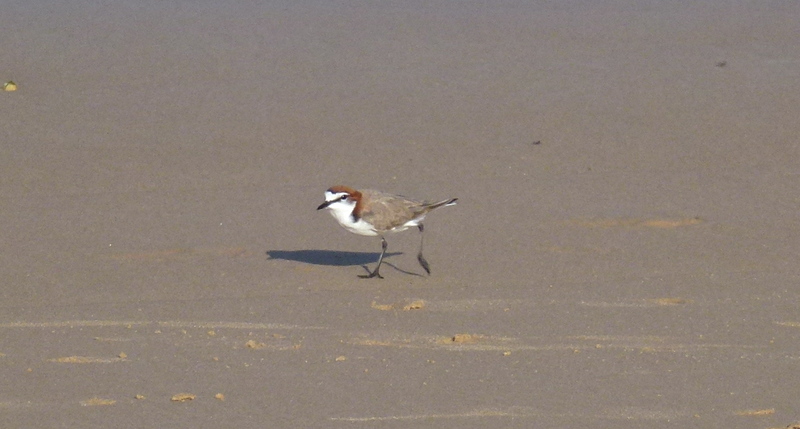 A closer look shows the reddish cap, clean white brow and breast and the sandy coloured back of the Australian native Red-capped Plover (Charadrius ruficapillus). 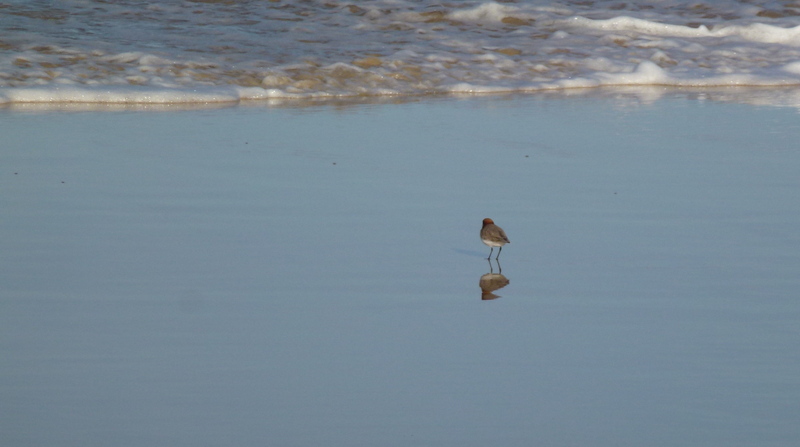 This bird was on the beach on its own but they are often seen in pairs or small groups. 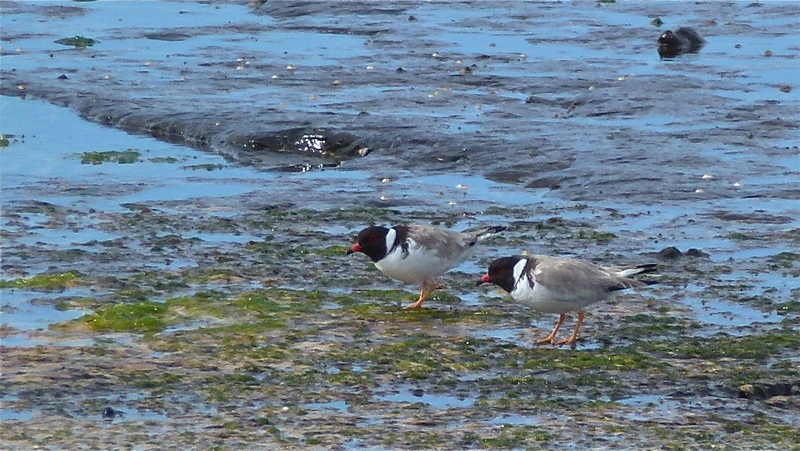 Red-capped Plovers frequent dunes, beaches, river banks and the margins of inland lakes. 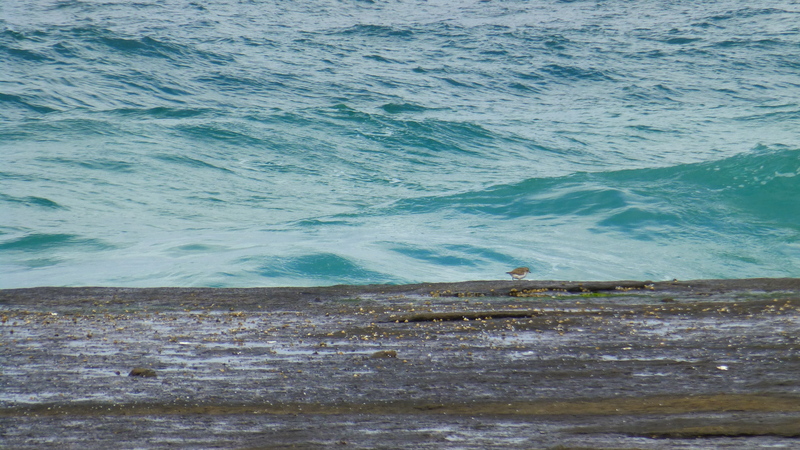 We watched in fascination as this tiny bird, only 15cm high, ran towards the incoming wavelets to catch the tiny insects off the surface or crustaceans turned over by the waves. 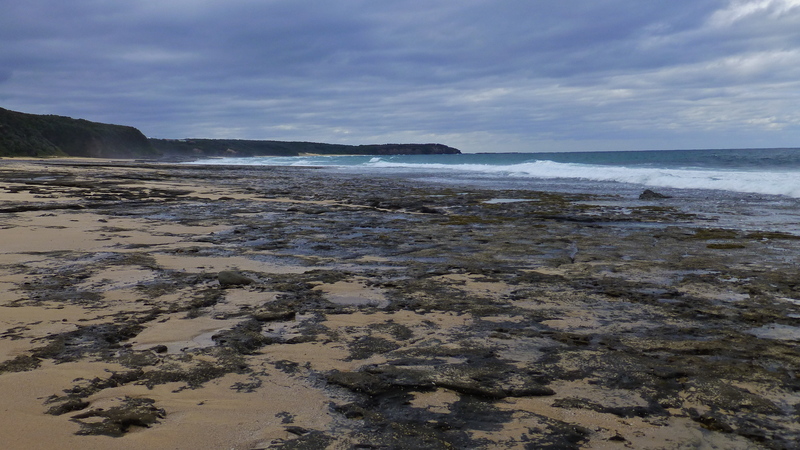 At the northern end of Racecourse Beach is a large rock shelf where we found the other two species of small plover – again both well camouflaged and very hard to see at first. 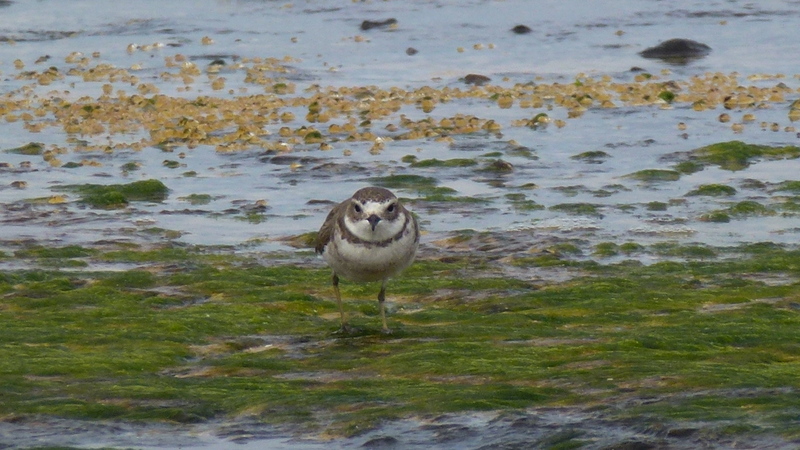 This small native Australian plover (20cm), sometimes called a dotterel, is fairly rare on the NSW south coast. It is more commonly found in Tasmania, along the coastal areas of Southern Australia and the south west of WA. It frequents ocean beaches, sand dunes, estuarine mud flats, exposed reefs as well as inland salt lakes in Western Australia. It’s a shy bird and easily disturbed so we had to move very slowly towards it. But patience was well rewarded with a good look at this well marked small bird. It’s entirely black-hooded, including the throat and shoulders, broken only by a very smart looking white nape band. The back is light-grey brown with a touch of black on the tail. The red bill is tipped with black. The red eye ring is rather lost in the black face. 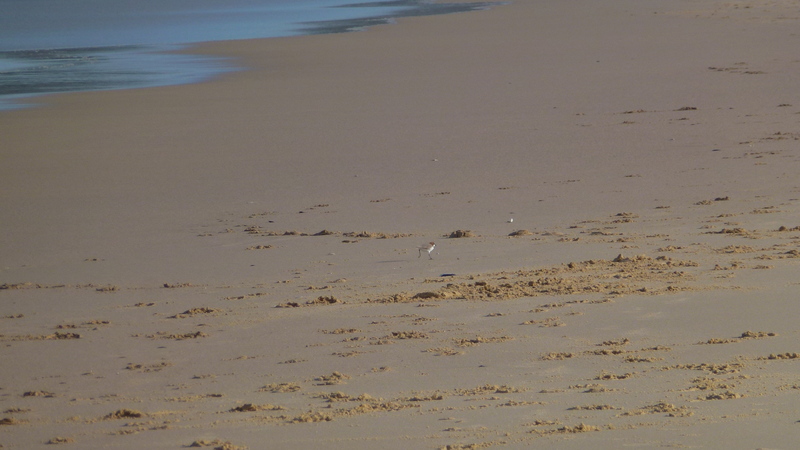 While watching the Hooded Plover, another bird flew in , so tiny it was almost invisible. It was not at all shy, came close and posed very nicely to have its portrait taken. 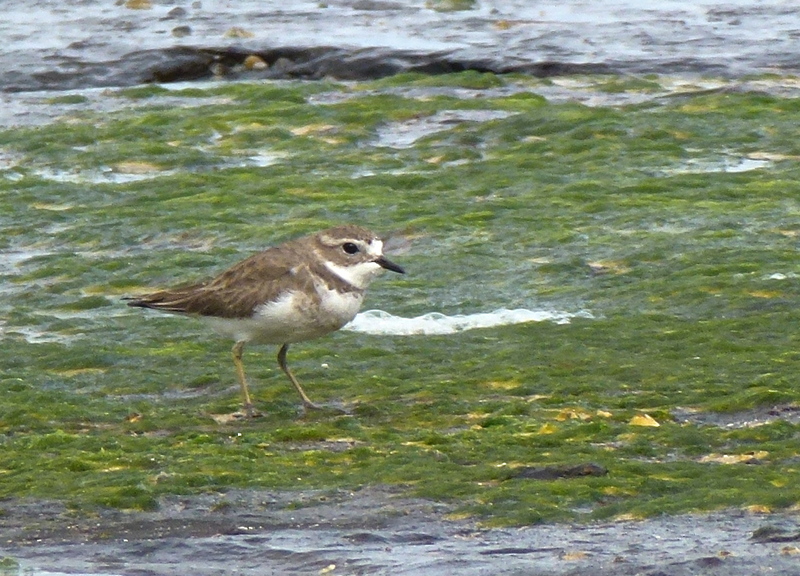 This was the Double-banded Plover, a trans-Tasman migrant. It breeds in New Zealand in summer and visits Australia during the winter months. It was probably a fairly new arrival. In New Zealand during the breeding period in summer, this bird sports a clearly defined black collar and deep reddish buff breast band. But when it’s in Australia during winter, these markings are muted, appearing as the softer buff coloured breast bands seen here. This is definitely not a shy bird. It seemed to be just as interested in us as we were in it! 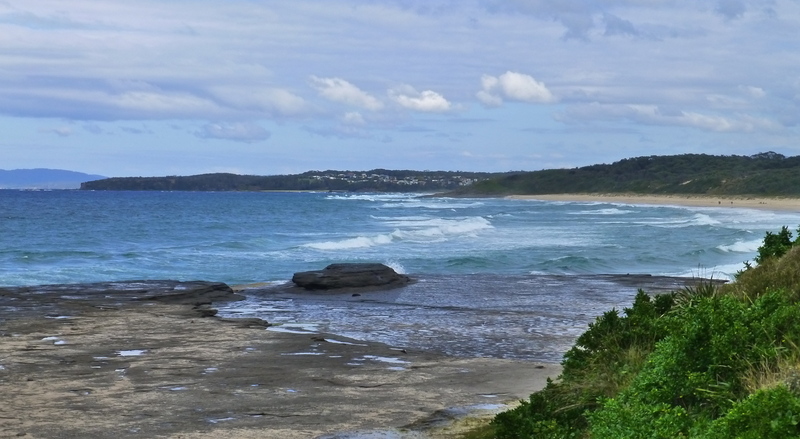 While in Australia, it frequents seashores and mudflats of eastern and southern coasts. 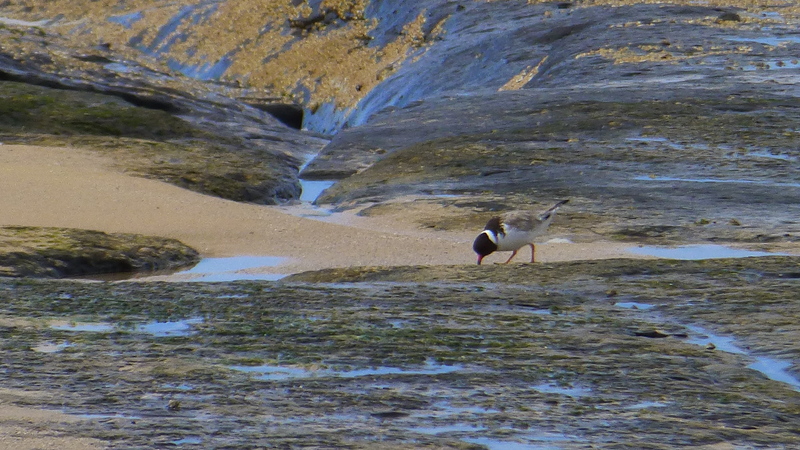 Sharing the rock shelf with the plovers was a Sooty Oystercatcher. 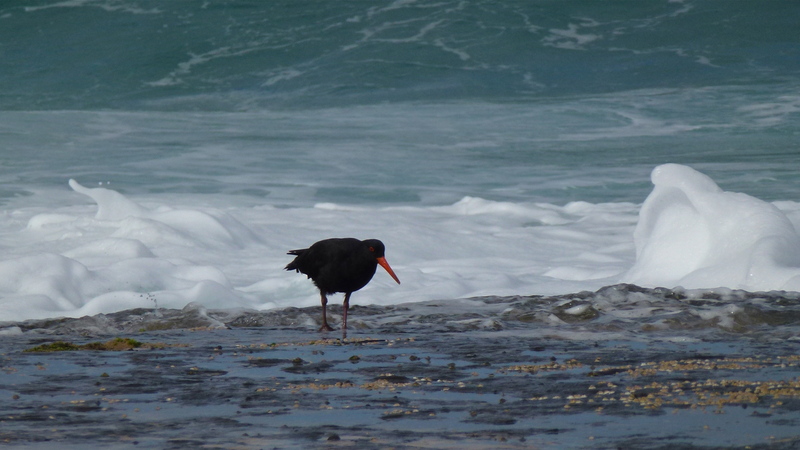 Not as common as the Pied Oystercatcher, this shy bird inhabits undisturbed ocean shores, preferring rocky ledges and reefs. It feeds on crustaceans, sea worms and molluscs using its strong, stout bill to break open shells and to prise limpets from rocks. There was plenty of food here! 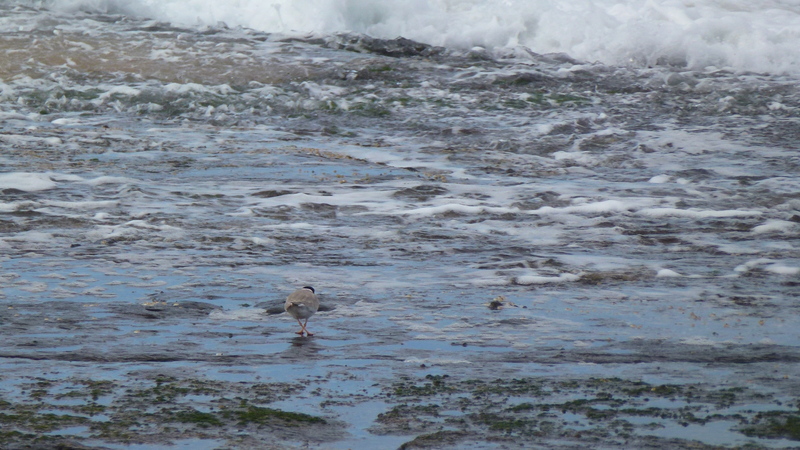 Not even a rising tide with its crashing incoming waves deterred this bird from its search for food. 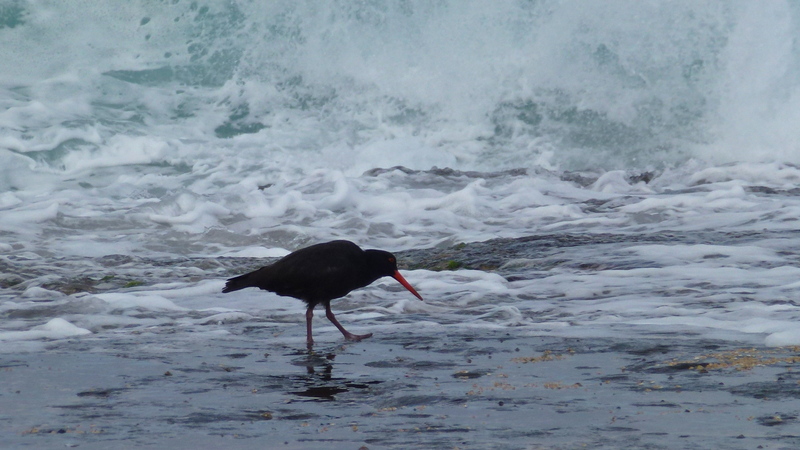 It’s a very solidly built bird with entirely black plumage and that makes it very difficult to photograph unless it can be shown against the white of the waves. But again patience was rewarded, and as the bird approached us, I was able to get that conspicuous red bill… and the red eye that is usually somewhat lost in the black face. 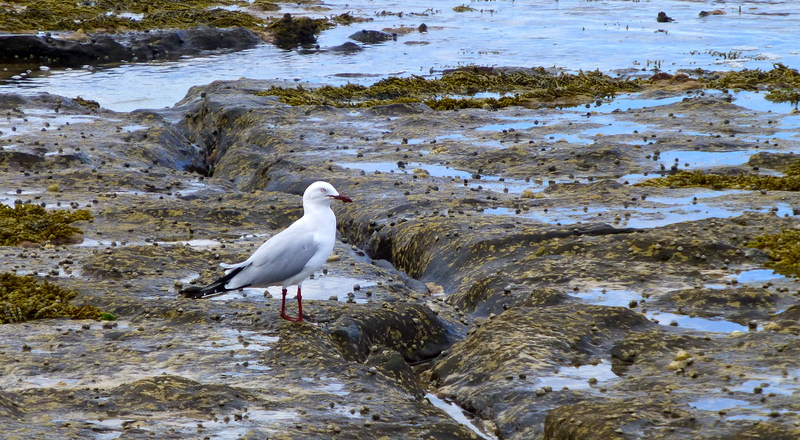 The only other bird on the rock ledge that morning was the smartly dressed but very common sea-side bird, the seagull. 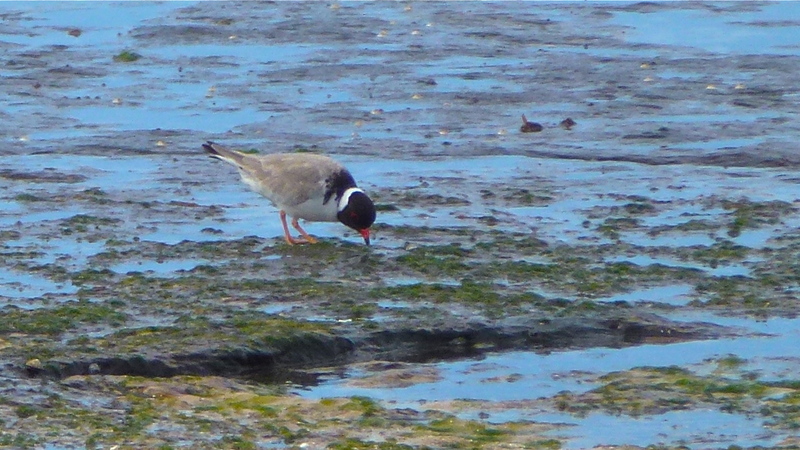 And close by was yet another of those much rarer birds, a petite Hooded Plover. 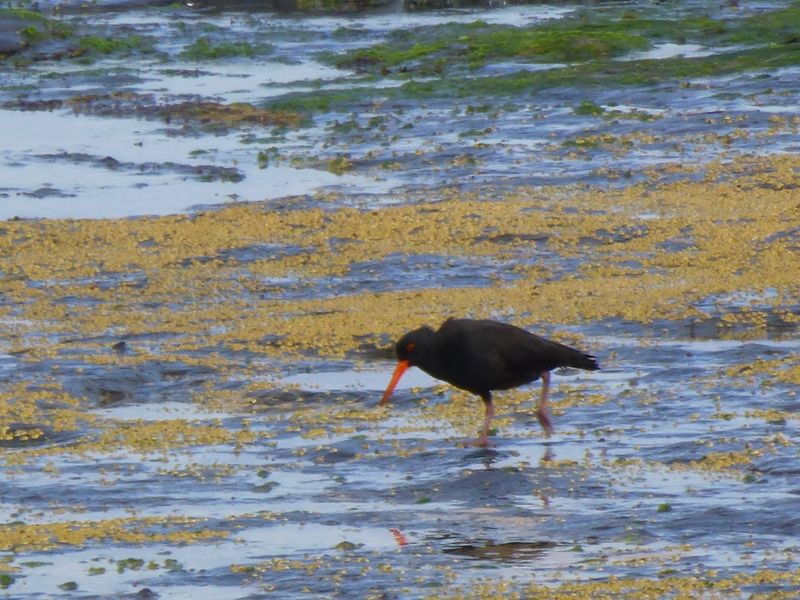 Once again the tide was on the turn – it was time to go and leave the birds in peace.